My latest improvement is supporting tables. It’s probably best to just show what it does. Now a user could just download the report, change fonts, layout, etc, and reupload it. It does have it’s limitations and is a work in progress but it’s already pretty cool. As a developer I can just define what variables can be used and let someone else make the report (and change it around later). To use it you just have to make the proper data structures, so really this could be ported to any data driven application, not just Django. Ubuntu 9.04 server running Django, MySQL, and Apache (LAMD?) Data models are defined in Django which automatically makes an Admin interface with some customization options. Django also makes short work of authentication with is done against Active Directory. 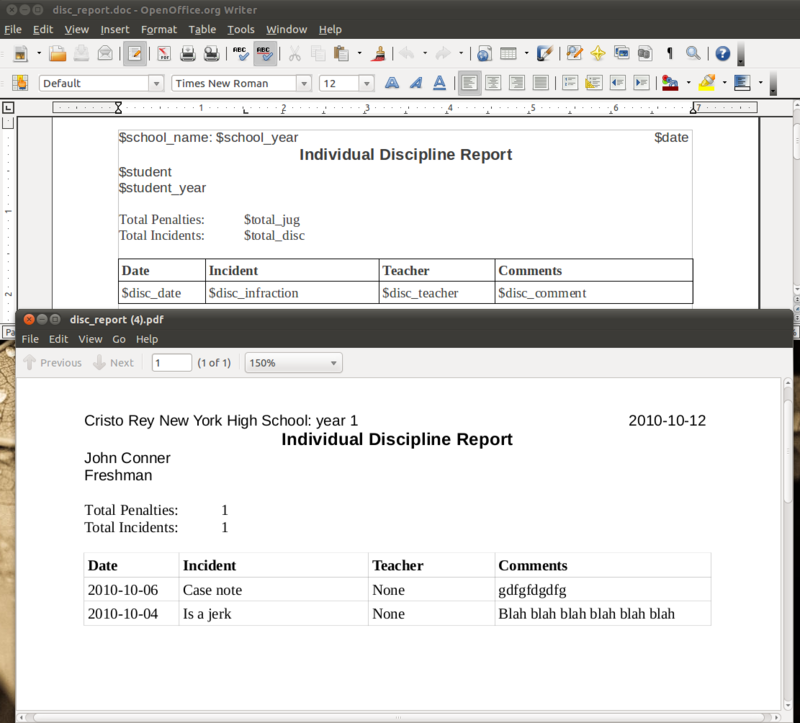 Reporting is done with PyExcelerator and pyRTF to make downloadable excel and rtf documents. It’s a pretty basic database but it really saves a lot of time compared to maintaining lots of xls documents and mail merges. Also it allows a technical worker to import exported data from other database into MySQL. Ideally this program could also be linked with other MySQL backend programs. So say I want to use SugarCRM I could symlink the contacts table so both Sugar and Django use the same one for perfect 2-way syncing. The real beauty of this is that it was so quick to develop. This is just been a side project for me. Doing it in PHP or .NET would have easily taken 3 times as long. Well I’ve been in nyc for a month now. The first few weeks have been hell with 60+ hour weeks at Cristo Rey but things are finally starting to calm down. At work I’m coordinating transportation for students to get to their work placements. I’ve completely redid the process in a short time I was there from a bunch of random Excel files and proprietary databases to something more maintainable, a MySQL database with Django. I’m impressed with Django’s ability allow me to make good data centric websites in only a few days. Django’s philosophy of defining data “models” once and having it create the database and administration page automatically is great. I’m then using pyRTF and pyExcelerator to generate reports from the data. We can now enter student, company, and contact data in at one place and have it reflect to all relevant reports such as daily attendance. The admin interface is easy enough to use that students can do data entry with it. Other new fronts include the possibility of moving from Act by Sage to SugarCRM should further streamline the process. The idea here would be that Sugar has more features and could integrate with my Django database, Outlook, and a smart phone. With some hacking around it looks like I can symlink(yay unix) a “contacts” table used in both Django and SugarCRM to keep them perfectly synced and keep Django happy in it’s data model land without manual SQL needed. I’m happy to be using my skills at the new placement, while also running the day to day activities at the school. Though it’s still a 10+ hour day with some Saturdays making it rather stressful. Other thing’s I’m looking into are Alfresco content management system, Zimba email server, and SchoolTool. SchoolTool is a decent school administration management tool. It’s written in Zope which is a python based framework. Python is quickly becoming my favorite language. It’s missing a few key features so I might hack on it to make it work. One unsolvable(?) problem with SchoolTool is that it uses ZODB, an object oriented database. This means it would be really hard to integrate it with the other databases I’m using. ln -s can’t save me this time..